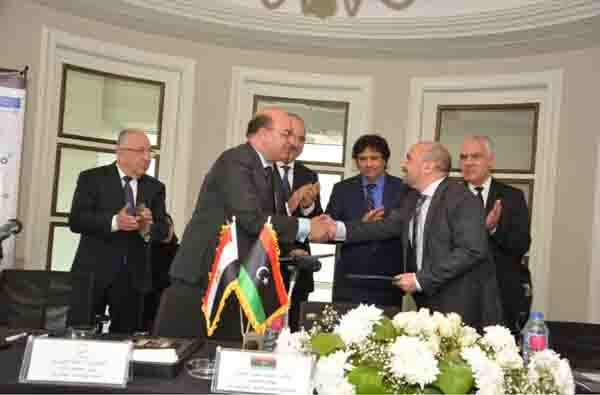 The Joint Libyan-Egyptian Economic Chamber and the Egyptian Raw Materials Manufacturing Association have signed a protocol to increase reconstruction raw materials trade (Photo: Libya-Egypt). Egypt’s Raw Materials Manufacturing Association and the Joint Libyan Egyptian Economic Chamber signed a co-operation protocol on Monday to increase bilateral trade and investments. The protocol was signed for the Egyptian side by Ahmed Abdulhamid, chairman of the Egyptian Raw Materials Manufacturing Association and for Libya by Hani Safrakis, president of the Libyan Egyptian Joint Economic Chamber in the presence of a number of other Libyan and Egyptian dignatories, including Mohammed Raied president of Libya’s General Union of Chambers of Commerce. The protocol hopes to integrate and create a complementarity between the Egyptian and Libyan private sectors in the reconstruction process of Libya. Building on its historic, cultural and logistic ties, and its price competitive advantage, Egypt hopes to secure the lion’s share of Libya’s reconstruction raw materials and labour needs. Egypt has a huge raw materials manufacturing sector and wants to position itself as a major regional player in MENA reconstruction efforts. The protocol also aims to offer training and exchange of know-how and experience with Libyan companies. 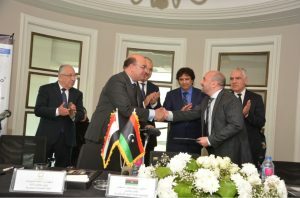 Speaking at the signing ceremony, Mohamed Raied, president of Libya’s General Union of Chambers of Commerce stressed the need for the normalisation of relations between the two countries by providing facilities to business leaders in both countries and facilitating the movement and entry of Egyptian labour into Libya. He complained about the fact that there were only two direct flights a week from Libya to Egypt, and only to Alexandria, compared to many more to Tunis and Istanbul. The head of the Joint Libyan-Egyptian Economic Chamber, Hani Safrakis, said that the reconstruction cost of Libya is estimated by the Workd Bank at about US$ 100 billion, adding that the Libyan government’s initial estimate of the number of workers Libya requires exceeds 3 million Egyptian workers. He said that the Tripoli-based government had made allocations for development in both its 2018 and 2019 budgets. These budgets represents a new opportunity and prospects for the Egyptian building materials and accessories sectors, he added. Safrakis said that Libyan-Egyptian trade had decreased from US$ 1.5 bn in 2013 to US$ 0.5 bn in 2017. He stressed the importance of re-evaluating Libyan security, taking into account economic benefits and common interests without security conditions so as not to harm common interests, especially Egyptian manufacturing. He also called for the amendment of the trade agreement signed between Egypt and Libya in 1991 and and that it should be re-activated and reformulated to cope with the new trade realities and common interests. He also called for the activation of the Salloum Logistics area during the coming period to activate trade movement and economic relations between the two countries.